Chilston Park Hotel Wedding Open Day: Setup was literally centre stage at this fair on the dancefloor. 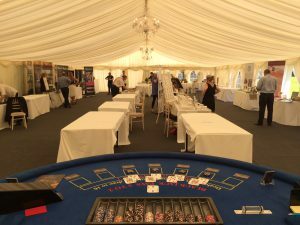 Suppliers and Brides to be were all in good spirits with the sun shining at what could only be described as a great venue. 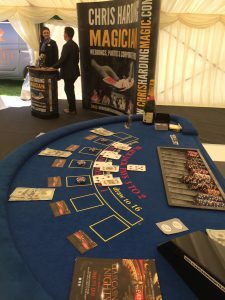 We have taken Fun Casino to Chilston Park Hotel for a number of weddings and parties and have always been well received. This was the first wedding fair though and thoroughly enjoyed. 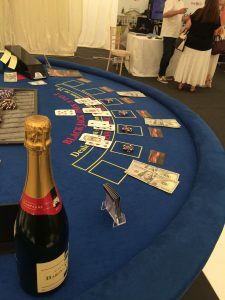 A bottle of Champagne was up for grabs during the fair with leaving your name and number and very pleased to announce the winner at this Chilston Park Hotel Wedding Open day was Kate. Great to meet some of the Events Team at Chilston Park Hotel and look forward to working with them in the future. 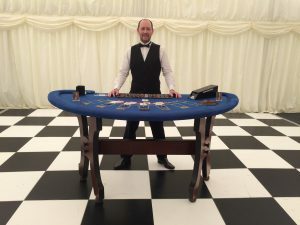 Please get in touch if you are looking to bring the Casino to your Wedding Entertainment, it’s a lot of fun and always remembered. Call now on 0845 591 1398.